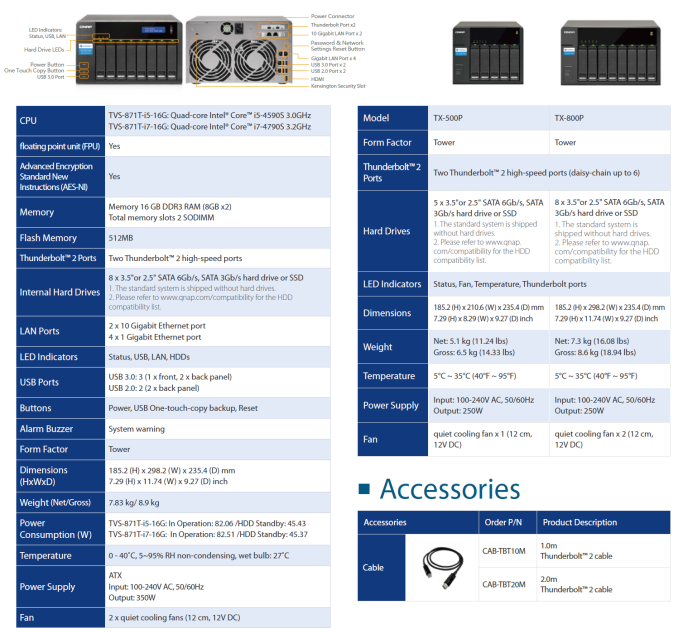 QNAP operates in SMB / SME NAS space and differentiates itself by providing consumers with plenty of choices when it comes to the hardware platform. Over the last year or so, they have been introducing a range of NAS models with 10GbE capabilities. Video production houses are one of the main targets of these 10G NAS units. In order to better serve that particular market, QNAP has introduced the TVS-871T - a 8-bay NAS with dual 10GbE ports as well as two Thunderbolt 2 ports. The TVS-871T is a tweaked version of one of their premium 10G NAS units - the 8-bay Core i5/i7-based TVS-871. The TVS-x71 series has two free expansion slots, and the TVS-871T has been created by just adding a Thunderbolt 2 PCIe card to one of the free expansion slots. The other slot is taken up by the 10G card. Obviously, the more challenging aspect is the support for Thunderbolt 2 in the QTS operating system itself. On the QTS side, the Thunderbolt connection is made to appear as an ad-hoc network link. This enables the TVS-871T's triple play feature - a direct-attached storage (DAS) unit using the Thunderbolt 2 links, a high-speed NAS unit using the two 10GbE ports and an iSCSI SAN over the same network ports. In addition to the TVS-871T's i5- and i7-variants, QNAP also has expansion enclosures designed to work with them - the TX-800P and TX-500P. These expansion enclosures also come with dual Thunderbolt 2 ports for easy daisy-chaining. Given the variety of connections (multiple network ports, including 10GbE ones, as well as the two Thunderbolt 2 ports), there are many possible usage scenarios. QNAP talks about four main ones, which are outlined in the gallery below. The hardware specifications of the various models being announced today are summarized in the table below. QNAP's TVS-871T has actually been doing the rounds in various trade shows over the last couple of months. Today, we are having the official launch in the North American market along with pricing details. The TVS-871T-i7-16G-US has a manufacturer suggested retail price of $3,199 while the TVS-871T-i5-16G-US comes in at $2,799. The two Thunderbolt 2 ports seem to be carrying a hefty premium over the vanilla versions (around $1000). However, the prices are reasonable when one looks at the cost of Thunderbolt SAN setups that can be replaced with the TVS-871T. Looking forward, the arrival of Thunderbolt 3 with the USB Type-C connector is sure to make such NAS / DAS / SAN triple-play units popular. Don't try to use this device as a standalone windows domain controller. The SAMBA and DHCP implementations are missing two CRITICAL components for it to work.